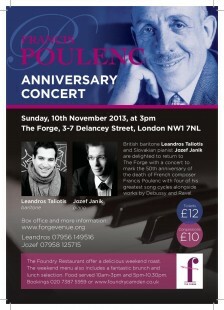 Following their hugely successful Schumann recital in March, British baritone Leandros Taliotis and Slovakian pianist Jozef Janik are delighted to return to The Forge with a concert to mark the 50th anniversary of the death of French composer Francis Poulenc. 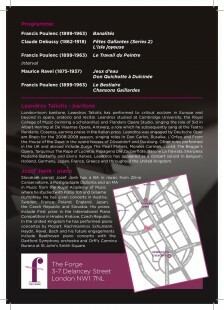 Leandros and Jozef present a selection of Poulenc’s song cycles alongside works by Debussy and Ravel. Francis Poulenc was a prolific composer of song, the perfect medium to explore his love of poetry and the human voice and brilliantly suited to the mixture of wit, irony, tenderness and melancholy that characterises his music. Much of his output was written specifically with his partner, the baritone Pierre Bernac, in mind. Le Bestiaire and Banalités are settings of Guillaume Apollinaire, whose poetry, often simultaneously joyous and sad, was a constant inspiration to Poulenc. Le Travail du Peintre is a setting of surrealist poet Paul Éluard’s celebration of great artists of the time, while Chansons Gaillardes is a bawdy romp through anonymous seventeenth-century texts. By way of both a compliment and contrast to Poulenc, this recital presents work by arguably the two greatest French composers of the early Twentieth Century. Debussy’s second set of Fêtes Gallantes is an awkward reflection on romantic encounters in the composer’s characteristic impressionist style. Ravel’s Don Quichotte à Dulcinée takes its influence from Spanish dances in the old knight’s songs to his beloved. The two solo piano works, Debussy’s L’isle joyeuse and Ravel’s Jeux d’eau represent a similar milestone for each composer – their first truly great piano work and the catalyst for the brilliant solo piano pieces that followed, as well as the cementing of their unique musical language.